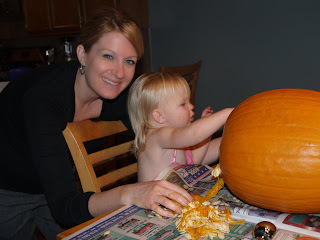 Thursday night we carved pumpkins! Skylar loved it, she wasn't phased by the 'goop' one bit...in fact after she pulled all the guts out she got bored waiting so she put them all back in!!! Chris tried a new carving technique, he decided to use his dremmel tool, it did work but if if does that next year he will be carving pumpkins in the garage, that thing sent pumpkin shavings flying everywhere!! !